4/16 Cup of Coffee: An offensive outburst gave Portland just their second win of the 2019 season. The Sea Dogs' lineup tallied 11 hits, including five doubles while C.J. Chatham (pictured) and Bobby Dalbec combined for five RBI's on the night. Things did not fare as well for Salem and Greenville, as both teams struggled to get anything going Monday night. Meanwhile, in what has become a feature of the minor league season, the PawSox had their game postponed due to inclement weather. Pawtucket had its third game of the season postponed due to inclement weather last night. The game will be made up tomorrow at 4:05 PM. The Sea Dogs put in their best offensive performance of 2019 with a season-high nine runs. C.J. Chatham led the charge with two doubles and three runs batted in while Bobby Dalbec recorded two hits (one double) and drove in two. Not to be outdone, Josh Tobias collected three hits and two doubles of his own. Jeremy Rivera also added a double while Brett Netzer contributed two hits, an RBI, and a run scored. On the mound, Tanner Houck recovered from his rough opening start with a strong performance Monday night. Houck spun five innings of one-run ball, striking out three, earning his first win of 2019. Daniel McGrath surrendered one run in his two innings of relief but struck out four while Jordan Weems did the same in his two innings of scoreless relief. It was a tough night at the ballpark for Salem, as the Red Sox were unable to get much going on both sides of the ball. Jarren Duran and Ryan Fitzgerald were the lone offensive standouts. Duran notched two hits and stole two bases, while Fitzgerald struck an RBI double and stole a base of his own. Garret Benge recorded the only other Salem RBI. Daniel Gonzalez was roughed up in his start, surrendering four runs on eight hits while only managing to strike out one batter. Devon Fisher fared much better in relief, striking out two in two scoreless innings. Jake Thompson gave up one run in his two innings of relief and struck out one. Things went similarly for Greenville in the opening game of their series with Charleston. The Drive bats were mostly silent outside of a solo shot by Kyle Wren and a double by Korby Batesole. Cole Brannen did not record a hit Monday evening, but he did steal two bases and drive in the only other Greenville run on the night. Alex Scherff struggled in his second start of the season. Despite a strong Opening Day start, the righty only made it through three innings, allowing three runs on six hits and three walks. Hunter Haworth went the rest of the way and struck out five batters in five innings of three-run ball. Player of the Day: C.J. Chatham played a crucial role in tonight's Portland victory with his two doubles, three RBI performance. 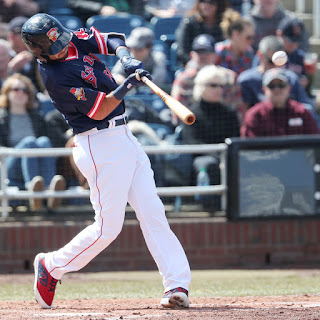 Long considered a defense-first prospect, Chatham has steadily risen up the ranks of the Red Sox farm system with strong offensive performances at every level and doesn't look to be slowing down at all in 2019. His two doubles tonight were already his sixth of the weather-shortened season and he has now brought his average up to .300.